5 Best Wheatgrass Juicer Reviews – Which Juicer Machine? As any serious juicer knows, a glass of wheatgrass juice is the Holy Grail of nutritious green drinks. Wheatgrass packs the nutritional punch of several servings of fruits and vegetables, and is full of vitamins, minerals, and phytonutrients, which will help you feel revitalized and rejuvenated! However, wheatgrass juice is incredibly expensive to buy. Plus, if you’re buying frozen or dried wheatgrass juice, you’re missing out on a good deal of the nutritional content. Making your own wheatgrass juice at home gives you the most bang for your buck, both financially and nutritionally! The problem is, most machines aren’t up to the task of pressing juice from wheatgrass. Most are inefficient or too weak to handle the pressure it takes to juice wheatgrass. Finding the right one can be a tough task, even for people who have been juicing for years! We went on a search for the best models available today. We compared features, specs, and buyer reviews for dozens of manual and electric machines, to find the best options out there. On this page, you’ll find our comprehensive reviews of the five best models on the market today! We’ve chosen our recommendations to fit a variety of budgets and needs. In our wheatgrass juicer reviews, we’ll talk you through all the key features, and help you see why we think these are the best options on the market right now. At the bottom of the page, we’ve come up with a few pointers to help you narrow down your search. 1 What Do I Need To Make Wheatgrass Juice? 3 Which Wheatgrass Juicer is Perfect for You? What Do I Need To Make Wheatgrass Juice? Wheatgrass is a wonderfully nutrient-rich grass that can be juiced for a healthy, energy-boosting drink. It tastes wonderful, aids digestion, and helps cleanse the body inside and out. However, in order to enjoy all the advantages of this delicious juice, you need a wheatgrass juicer. Trying to make wheatgrass juice in a regular blender won’t work—it will just make a mess! The fine grass blades will become entangled in a regular kitchen blender, and it simply will not work right. There are two types of juicers that are appropriate for making wheatgrass juice, one manual and the other electric. When looking for a wheatgrass grinder, make sure it is durable, made of high quality materials, easy to clean, and easy to use. A manual juicer is a hand cranked device that grinds and crushes the wheatgrass to extract the juice so it can be strained and enjoyed. 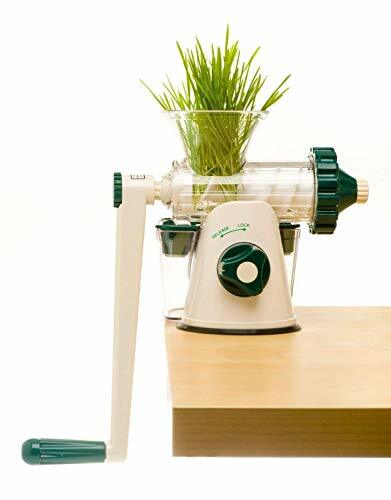 Many manual wheatgrass juicers are easy to assemble and clean. They have the benefit of not requiring electricity. These types of juicers come equipped with a clamp (or sometimes, a suction cup), that attaches to a countertop or table, so you can use them anywhere. Whether you’re staying at a hotel on a business trip, or picnicking at the beach, you can create fresh wheatgrass juice anywhere with a manual juicer. Often made from stainless steel or plastic, this type of juicer is very sturdy and easy to use. An electric wheatgrass juicer is also called a cold-press or a slow masticating juicer. This machine works by slowly crushing the plant products very finely, forcing it between gears or crushing it with an auger, to extract the maximum amount of juice. This minimizes foam and helps bring a higher yield of juice from your grass. While an electric wheatgrass juicer is more expensive than a manual one, they are more versatile. Slow-speed masticating juicers can be used to make a variety of juices, but a hand cranked manual juicer can be used only for wheatgrass juice. In addition, most slow masticating juicers have other useful kitchen capabilities like food processing, grinding, homogenizing and more. Both types of wheatgrass juicers are useful, so consider your needs and explore your options when looking for a wheatgrass juicer. These are our favorite top 5 picks for juicers that work best with wheatgrass. A centrifugal juicer, typically used for making fruit juices, can’t be used for wheatgrass, so you’ll need to decide if you want a slow mastication juicer or a traditional hand crank juicer. Both of these types have their own benefits, so we’ve reviewed the best of both kinds so you can select what is right for your needs. Prices in wheatgrass juicers begin as low as $49.99 for a manual juicer, so making fresh juices is more affordable than you think. A low price doesn’t necessarily indicate a low quality product, and just because something is more expensive doesn’t mean it will work the best for what you need it to do. If you are just starting off with wheatgrass, or primarily drink wheatgrass juice rather than other fruit or vegetable juices, you may want to begin with a small and economical design. However, if you’re planning on making a variety of juices, a slow masticatio﻿﻿n juicer might be a better option if you can afford it. Similarly, consider how much wheatgrass you need to make. If it just for yourself, a small hand crank juicer might be enough. If you’re juicing for your whole family, it is certainly worth the investment to purchase a time-saving cold press juicer. The Healthy Juicer is one of the most affordable models on the market. Because it’s so affordable, it makes a great second machine for wheatgrass drinkers on the go, or people who want an inexpensive option for a dedicated wheatgrass juicer. 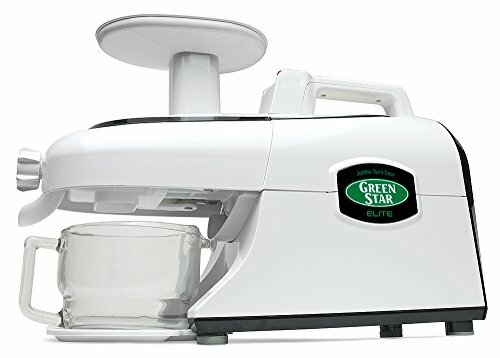 We like the Healthy Juicer more than other budget manual models because of its user-friendly design, ergonomic handle, and superior reputation for reliability. One of the best innovations of the Healthy Juicer is the fact that it works without a juicing screen. If you’re a dedicated juicing fan, you know how annoying it can be to clean the pulp screen on any model. You have to spend time and energy scrubbing out each and every little hole to loosen up pulp. That’s not ideal for people who want a quick, easy drink of wheatgrass juice in the morning. The Healthy Juicer works without a screen, which makes the whole process much quicker! It’s easy to attach to your counter or table. The Healthy Juicer has two attachment options, so you can choose the one that works best for your space. The suction base is a good choice for countertops with no lip, or tables without a sturdy edge. You can also use the clamp for a more secure hold on strong counters and tables with a good overhang. Another thoughtful touch about this model is the included wrench tool. This makes it easier to tighten either the clamp or the suction base. You’ll save your wrists, and get a more secure hold on your counter! It works for much more than just wheatgrass. The Healthy Juicer will work for all other leafy greens, like kale, chard, and spinach. You can also juice fruits and vegetables, provided you do a bit of prep work. Previous buyers said they got great results from julienned carrots, beets, and apples. This makes it a good travel option for people who make lots of different juices in addition to wheatgrass. The Healthy Juicer is much better built than other models at this price. While it’s built from plastic, it uses metal reinforcements where they count. There are steel end caps at either end of the auger, to keep it from wearing down over time. The clamp and suction base use lots of metal parts, as well. Our research showed that even the plastic parts have a much better track record than other cheap models. All of the plastic parts are BPA-free. That’s another big plus over the cheaper, knock-off models. You don’t have to worry about any chemicals leaching from the plastic into your juice, even as the machine ages. The Healthy Juicer is much more ergonomic than other hand machines. It has an extra-long handle, which helps you get more torque on the auger. This makes juicing less of a chore, and helps the whole thing crank more smoothly. The whole thing is very light, too, at just 2.4 pounds. Most importantly, this model is much more reliable than other budget manual machines. It’s made by a reputable company, has been on the market for a few years, and has solid customer service. Lexen covers this model with a 1-year warranty, and previous buyers who had questions said their customer service responded promptly and helpfully. A number of previous reviewers found the Healthy Juicer frustrating to use. They said it was hard to crank, or leaked from the end cap. Judging by responses from other previous buyers, a lot of issues were due to user error. You’ll want to be careful to give it time to work, and make sure you read the manual before you start juicing. The one real complaint we found about the Lexen is durability. While it has a much better reputation than other plastic manual machines, it’s never going to last as long as a metal machine. The major problem spots were the auger and the handle, which obviously take the most strain. Any breakages during the first year would be covered by the warranty, but this isn’t one that you can expect to last for life. We prefer it as a low-cost travel option or as a budget machine for home. The Hurricane is one of the best-built models on the market. It’s a manual hand-crank model that’s been specifically designed for juicing wheatgrass. The Hurricane has a specially tapered auger and chamber for squeezing small blades of grass. We love it for its sturdiness. It’s ideal for the serious wheatgrass drinker who wants a machine that will last for years! It’s incredibly sturdy. The whole thing is built from stainless steel, including the auger, housing, handle, and feed chute. Given the high pressure involved in juicing wheatgrass, the steel construction makes a real difference over time. None of these parts are going anywhere. The Hurricane is a big step up from the cheaper plastic options. If you were to find this kind of build quality in a motorized machine, you’d be spending over $1,000. Many ardent juicing fans who reviewed the Hurricane said it’s a welcome change from all the cheap, disposable kitchen tools we’re accustomed to in the 21st century. The Hurricane is built like those old fashioned kitchen gadgets that get passed down through families. Previous buyers said it was very reassuring, and some wrote that they’d been using them for years with no issues. While it’s built like a 20th century appliance, the Hurricane has a few smart features that make it easier to use today. There’s a pressure adjustment knob for tightening and loosening the end cap on the auger chamber. This is great for sorting out clogs and jams, as well as juicing shredded fruits and vegetables, which don’t need as much pressure as wheatgrass. There’s also a rubber grip on the clamp, to make sure you don’t damage your countertops or tables as you juice. 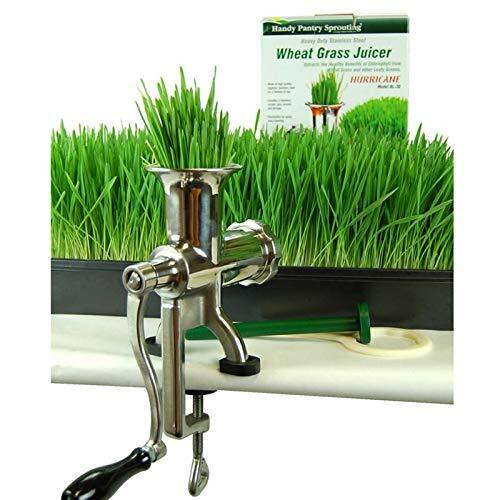 The auger and chamber are designed to give you maximum yield from your wheatgrass. The Hurricane’s chamber is tapered specially to squeeze every drop out of tiny blades of wheatgrass. This is also where the pressure knob comes in handy. You can double down on the pressure to crush wheatgrass more thoroughly than you can with other models like the Healthy Juicer. Since it’s built so sturdily, we weren’t surprised to see that there aren’t any complaints about reliability with the Hurricane. It’s also covered by a 5-year warranty, in case of any manufacturing defects. While it costs a good deal more than the Healthy Juicer, this isn’t a product you’ll have to buy twice. The design is super simple, which makes cleaning and assembly a breeze. The stainless steel parts rinse clean, and there are only 3 parts to clean, besides the frame. The Hurricane isn’t nearly as affordable as the Lexen. We recommend it to people who have wheatgrass every day, and know they won’t be stopping anytime soon. The Hurricane is designed specifically for wheatgrass, and most previous buyers said it was more user-friendly than other models they’d used in the past. However, it’ll still require some elbow grease. You’ll also have to plan on a learning curve while you find the ideal pressure setting for your wheatgrass. Unlike the Healthy Juicer, the Hurricane uses a traditional pulp screen. That means you’ll have to have a brush handy for scrubbing out all the little holes. Thankfully, you can stick the screen in the dishwasher. The Tribest is our recommendation for people who juice wheatgrass as part of a larger juicing regimen. It’s one of the only motorized juicers that does a really good job on wheatgrass. The triturating design and toothed augers help the Green Star bite into blades of grass better than any masticating juicer. We also love the Green Star because it works for all sorts of additional kitchen projects, like grinding and homogenizing. It’s a triturating juicer, which provides complete masticating of wheatgrass, fruits, vegetables, and leafy greens. Masticating juicers like the Lexen and Hurricane rely on a single auger to press wheatgrass and other produce against a juicing screen. The Green Star improves on that system by introducing a second auger. The two augers fit together tightly, which helps make sure every single blade of wheatgrass gets completely chewed. Triturating juicers are the most efficient type for leafy greens of all kinds. The Green Star’s augers are specially designed to mimic the human jaw. They’ve got a variety of cutting blades and matching recesses, which all chew produce in different ways. There are sharp blades like our front teeth, and blocky, crusher ridges to smash cell walls and unlock all those precious nutrients. The Green Star is also a slow juicer, through and through. Its special gear-reduction drive system provides lots of torque power without going above 110 rpm. This means your wheatgrass and other juice is safe from oxidation and motor heat. You’ll get many more nutrients out of each glass than you would from a centrifugal “fast” juicer. You can adjust the pressure between the augers, much like the pressure screw on the Hurricane. This helps you get the tight fit you really need for juicing wheatgrass. You can also loosen things up for juicing all your other produce, like apples, carrots or beets. Since the Green Star is the only one of our recommendations that’s really designed to handle fruits and vegetables, you won’t have to shred produce before you juice. There are two juicing screens in the box. This lets you choose the pulp level in each glass of juice. We like the finer screen for greens and wheatgrass. The other screen is a better bet for juicing soft fruits like citrus or tomato. Having control over pulp is also great if you’re juicing for other people. We all have our one pulp preference, and it’s nice to have a juicer that’ll work for everybody. The Green Star is a very versatile kitchen appliance. It comes loaded with all the attachments you’ll need to use it as a grinder, homogenizer, and a food processor. You can make nut butters, milks, pastes, and sauces. With so much versatility right out of the box, the Green Star provides great value for money. It’s a good buy for wheatgrass drinkers who make lots of other homemade food. There’s a handle built right into the casing. This is helpful for lifting the Green Star around for storage. The Green Star is built to last for years of daily use. The augers and the drive shafts are built from stainless steel. The juicing screens are stainless steel, as well. All of the casing is made from heavy, food-grade plastic. We also like the smart design features which help keep the juicer safe as time goes on. 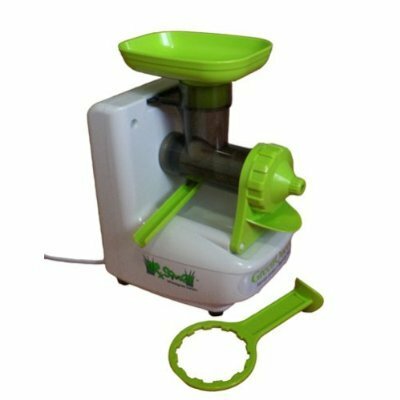 The pressure adjustment knob protects the motor from strain, and the nylon safety buffers keep the augers from coming together and damaging the whole juicer. The whole thing is covered by a very impressive 12-year warranty. The Green Star isn’t as convenient to use for a quick shot of wheatgrass. It takes longer to set up and to clean than either of the handheld models. You’ll also have a larger juicing screen to scrub. Most previous buyers said that they eventually got into a routine that took only 5 minutes or so. However, it’s more cumbersome overall. The Green Star is no small purchase. However, you will want to consider what you’re getting for the price: a universal juicer, a grinder, a food processor, and a homogenizer, all in one package. The Miracle MJ445 Stainless Steel Manual Wheatgrass Juicer is a very high-rated wheatgrass juicing machine. It is very similar to the Hurricane Wheatgrass Juicer. Non-toxic stainless steel is used so that the juicer is free of bacteria and it can juice leafy greens and soft fruits. The Miracle MJ445 crushes the fiber in order to extract the juice. Through cold pressing produce can be preserved with its own natural flavors and nutrients. This efficient juicer is sturdy and very easy to use. Which Wheatgrass Juicer is Perfect for You? The Healthy Juicer is the most affordable option, by quite a bit. It’s our recommendation to buyers on a budget. It’s also a great choice for people who want a travel juicer for wheatgrass and other greens on the go. However, it takes quite a bit of prep to work with larger produce and isn’t as durable as more expensive juicers. For the most serious juicing fans, we strongly recommend the Hurricane as a dedicated machine. It’s specifically designed to handle wheatgrass, and it does so exceptionally well. It’s more efficient than the Lexen, and will last much longer, thanks to its stainless steel build quality. However, it’s a lot to spend on a manual juicer. The Green Star is our recommendation to wheatgrass drinkers who also do lots of other juicing. It’s the only one of our recommendations that’s designed to handle fruits and vegetables, and one of the very few motorized juicers that’s actually appropriate for wheatgrass. We also love that it can work as a food processor, grinder, and homogenizer for making other homemade goods. The downside is that it’s a sizable investment. Only a few types of juicers can handle wheatgrass. You’ll want to look at masticating hand juicers or motorized triturating juicers. Centrifugal juicers don’t have the efficiency to juice wheatgrass, and many motorized masticating juicers don’t have the necessary teeth or grooves to gnaw into small blades of wheatgrass. Triturating juicers and wheatgrass-specific handheld juicers are your best bets for juicing wheatgrass efficiently and effectively. When you’re shopping for your new purchase, keep in mind that juicing wheatgrass requires an auger with teeth and a lot of pressure in the juicing chamber. Since wheatgrass requires a lot of pressure in the juicing chamber, it can cause augers and housing to crack or warp. You’ll want very hard plastic or metal housing and augers. With regard to efficiency, you’ll want a juicer with a very narrow cone, and a tight fit between the auger and the housing. One key feature to look for is pressure adjustment to really buckle down on wheatgrass and make sure you’re not letting any drops slip through into the pulp bin. The cheapest option available is a manual, hand-crank juicer. These start at around $20 for a plastic model. More expensive manual juicers can cost between $100 and $200. If you want a motorized machine, you’ll need to buy a triturating model. 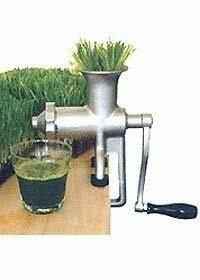 Triturating juicers have dual augers with teeth to gnaw into the blades of wheatgrass. They’re the only motorized juicers that have the efficiency to get the juice out of tiny wheatgrass blades. Unlike manual models, triturating juicers will work for all your other juicing needs, including fruits and vegetables. The downside is that they cost quite a bit more than other motorized juicers. Triturating models start at about $500 and can cost well over $1,000 for high-end models. You'll Be Surprised By These Foods You Should Never Eat Raw! Add Mushrooms to Juices and Smoothies…WHAT? Be Sure Your Juices & Smoothies Have More Vitamin K!